Julie entered this into a chili competition and received many compliments – it’s full of flavor and very delicious. 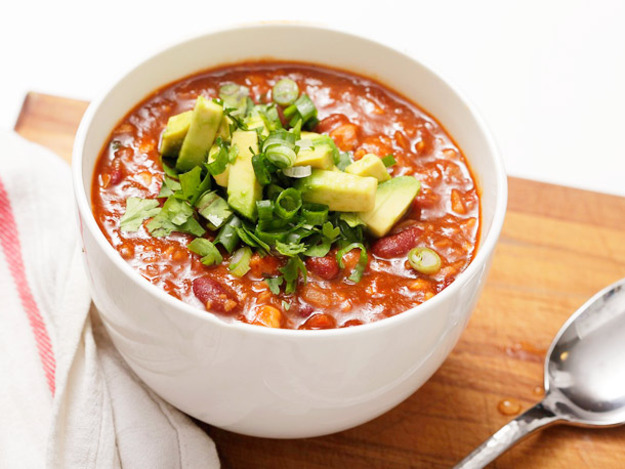 She’s made many chili recipes but this one tops the charts! Heat a large soup pot to medium, add oil. Sautee the onion until soft. Add all the other ingredients except for the liquids, beans, and soy crumbles. Allow to fry in the pan for 30 seconds to become fragrant. Add all the liquids and bring to a boil then reduce to a simmer. Simmer the mix for 3-5 hours. It will reduce and the flavor complexity will increase the longer you allow it to simmer. Stir periodically. Just before removing the base from the heat, brown the soy crumbles in a separate pan. Drain and rinse the beans. Add all the beans and the soy crumbles to the pot. Cook until the beans/soy are heated through. Remove the cinnamon stick & bay leaves before serving. Enjoy with Tofutti Sour Cream, Go Veggie Vegan Mexican Cheese Mix, chopped scallions and some avocado slices!